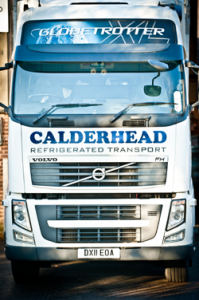 Calderhead Refrigerated Transport is a family owned and managed business which provides frozen and ambient storage and national temperature controlled distribution for food manufacturers and suppliers, from our site in the Midlands. We are BRC accredited for Storage, Distribution and food delivery services. The business was founded in 1993 by Ian Calderhead, who started driving for a food manufacturer based in Redditch. He felt that he could provide a better service and reduce costs by setting up a separate company. 20 years later we are still delivering for this customer… along with many others. We have also retained our founding ethos of offering real customer service and value for money. Ian retired in 2011 and since then Sara Owrid, his daughter has managed the company. Sara has extensive retail experience at a senior level, covering buying and merchandising and supply chain with retailers such as Sainsbury’s, House Of Fraser and Goldsmiths. Our main business focus is on consolidated multi drop deliveries to food service depots, operating on a weekly schedule throughout the UK. We offer clients exclusive storage or food delivery services but also pride ourselves on our real point of difference in the level of service our customers receive on combined storage and delivery solutions. 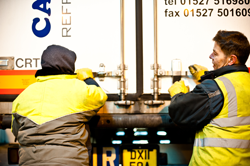 If you would like any more information about our multi drop deliveries, food delivery services or cold storage, Call Calderhead Refrigerated Transport today on 01527 516 980.